Cruise ships dock in the port. The city of Heraklion provides shuttles to the passenger terminal (a 5 minute trip) from there on it is a pleasant 15-minute walk along the seafront to the old town, where all the main sights are concentrated. Taxis are readily available in front of the port. 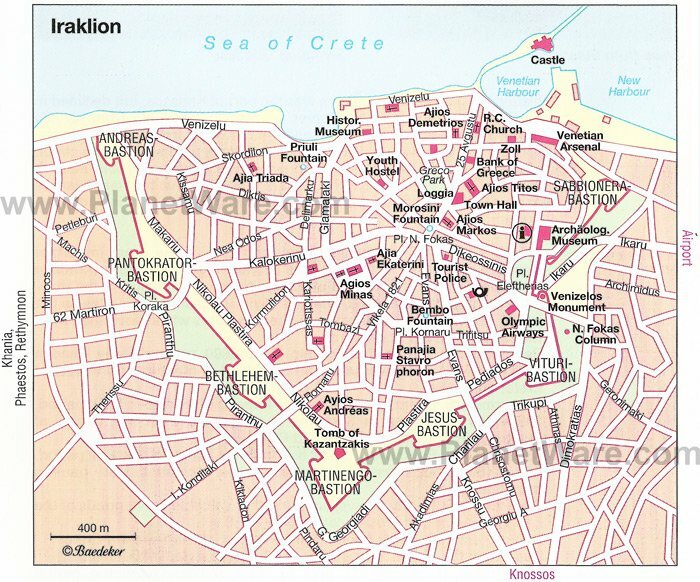 In the Iraklion (Heraklion) cruise terminal there is a tourist office with free city maps. Heraklion offers a wealth of museums, a summer-long arts festival, historical sightseeing, amazing nightlife and events throughout the year. The core of the city is still enclosed and defined by the Venetian wall, which includes seven out jutting bastions. In the southernmost of these, the Martinengo Bastion, is the grave of Nikos Kazantzakis, standing on a windswept hilltop with its moving inscription, "I hope for nothing. I fear nothing. I am free. Get to know Heraklion and stop to visit the Palace of Knossos just outside the city on this open-top hop-on hop-off tour. To get to the bus station, exit the port gates, turn right, walk until you see the bus station on the opposite side of the road and then cross the street. There is a little booth near the back of the bus station that sells the tickets for the Knossos bus. It is well marked. Knossos is the site of the most important and best known Minoan palace complex in Crete. It is located some 5 km (3 mi) south of Heraklion. According to tradition, Knossos was the seat of the legendary Cretan king Minos. The Palace is also connected with further legends, such as the myth of the Labyrinth and the Minotaur, as well as the story of Daidalos and Ikaros. Excavation has revealed that the site was continuously inhabited from the Neolithic period (7000-3000 B.C.) until Roman times. Admission: 6.00 euros. Combined Knossos and Heraklion Archaeological museum ticket: 10.00 euros. Sundays (November to end of March) free for all! For many visitors, Heraklion's most memorable shopping experience is a stroll along Odos 1866, the street where the open-air market is held (Mon-Sat, 8am-2pm). Stalls are piled high with everything from seasonal fruit and vegetables, to discount socks, towels and T-shirts. It's also the perfect spot to hunt for typical Cretan souvenirs such as thyme-flavored honey, dried herbs and teas, olive oil and olive-oil based cosmetics, as well as pumice stones. At the top of Odos 1866, in a side street leading to the right, you'll find the fish market. "Cash is king" in Greece - prices for many items can be lower if you pay cash and credit cards do not always receive an automatic welcome. Free WiFi in the terminal.